Museum curators oversee the collection of historic pieces, artwork, and other key items in museums. They meticulously procure authentic artifacts and ensure their safe storage and exhibition for all museum visitors to enjoy. Museum curators direct the procurement of artifacts for display at museums. They negotiate prices, authorize the acquisition of pieces, and most importantly, authenticate all of the museum’s purchases. Once these items are a part of a museum’s collection, curators care for, display, and interpret these items for museum visitors. Are you interested in art, history, and other related disciplines? Are you willing to perform marketing, public relations, and other key tasks besides your main responsibilities? Finally, do you have the patience to clean and preserve delicate museum pieces? Answer yes to all 3? Perfect. You’re well on your way. 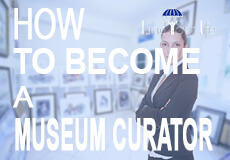 Now, follow this Land Your Life guide to land your career as a Museum Curator. According the U.S. Bureau of Labor Statistics (BLS), some small museums may offer employment opportunities to curators with a bachelor’s degree, who have completed an internship at a museum and taken courses in museum-related disciplines. Candidates like these usually earn their bachelor’s degree in business administration, marketing, and public relations, to name a few. In such cases, the curators will often work in administrative and managerial roles. Most museums, however, require curators to have a master’s degree in art, history, archaeology, or related discipline. The BLS recognizes the advantage that curators with two graduate degrees have in the job market. Master’s degree students usually choose a field to specialize like Native American history or Chinese Art. During these years, it’s highly recommended that students complete courses or electives in museum studies, like grant writing or organizing exhibitions. Some museums, particularly natural science and history ones, prefer their curators to have doctoral degrees. BLS also explains the importance of experience. The key to becoming a museum curator is acquiring extensive experience in research, exhibit design, collection management, and other museum related roles. It’s common for aspiring museum curators to work their way up at museums, starting in assistant roles. Museum curators have one main goal: to promote culture and educate people who go to museums. They perform various roles, outside of their main responsibilities, to ensure that this main goal is achieved. For instance, they help with fundraising initiatives by cultivating donors and writing grant proposals. Funds help to secure the future of the museums they work for. Curators also do plenty of promotional work to entice people to visit museums. They act as public relations’ specialists and write journal articles and other marketing materials to promote their museums’ exhibitions. Among their many responsibilities, curators also help to conduct their museum’s research and educational programs. The U.S. Bureau of Labor Statistics (BLS) recognizes that curators who work for large institutions can expect to travel extensively to conduct research and find new additions to the museum’s exhibitions. What Does an Average Day For A Museum Curator Look Like? Museum curators wear many hats within their profession, often overseeing the museum’s marketing, sales, research, and other key daily responsibilities. Museum curators are in charge of collecting new pieces for display. These acquisition ventures typically involve researching items, negotiating prices, acquiring funds for the purchases, and a great deal of budget planning. On a typical day, curators can expect to perform any one of these duties from planning to acquire an artifact, to making the final purchase. Once acquired, museum curators must catalog and keep records of all museum purchases. Additionally they’re in charge of storing and preserving delicate artifacts. Museum curators are responsible for designing exhibitions. They start the process by meticulously cleaning museum artifacts and prepping them for display. They then must accurately categorize all museum pieces and display them accordingly. Displaying objects is no easy feat. Curators have to do so in such a way that’s accessible and engaging to museum visitors. They must also select appropriate themes for the exhibitions, organize seamless tours for the public, and conduct some in-house lectures. Curators are often in charge of managing, recruiting, and training staff. They pass down their knowledge of caring for artifacts so that staff can assist with preserving and displaying museum pieces. Museum employees are also taught how to respond to visitors’ questions and inquiries. If employees continuously perform outstanding work, it is the curator who provides professional development tools and promotions for staff. Museum curators act as marketers and public relations specialists within their communities. By doing speaking engagements at schools, local events, and among community groups, they get the word out about their museum’s collections. Such promotions are also a great way for the curator to secure sponsorships for events, and funds for purchasing new items. Since the government owns many museums, curators must spend some of their time liaising with governors, trustees, and other political groups to share the latest news and exhibition accomplishments. This can help secure the future of their museums. Since museums rely on donors and patrons to sponsor exhibitions, events, and other museum-relates costs, curators have to perform various donor cultivation roles. They contact past donors and see if they can secure more funding. They also promote programs via grant proposals in order to cultivate new donors for the museum. Are You Suited for a Museum Curator Career? Museum curators have a set of important qualities that make them successful in their career. They have strong analytical skills to authenticate artifacts, determine the origin of collection items, and accurately measure the value of said items. Curators are also creative professionals and it’s this creativity that allows them to design beautiful exhibitions and seamless tours. Curators’ organization skills help them to logically catalog, store, and retrieve records of all museum items. This makes designing exhibitions and conducting sales a seamless process but it’s especially important for tax and budgeting purposes. Curators need to also have great communication, managerial, and teamwork skills since they’ll be working closely with other museum staff. They’ll need to be patient with employees when conducting training but still deploy strong management skills so employees are never idle. In addition to these traits and skills, curators need to have expert customer-service skills to keep visitors and local communities interested in their museums. Since they regularly communicate with the general public, curators must be friendly, approachable, and passionate individuals in order to inspire interest from their local community. Curators must also be proficient in a variety of technical skills. They’ll need to know how to preserve delicate artifacts and what materials to use in order to do so. Since artifacts could be sensitive to certain surroundings, curators need to be proficient in manipulating outside environments (like lighting or exposure to air) in order to preserve their museum pieces. In addition to these proficiencies, curators must master various roles outside of curating items. They’ll need to be proficient in marketing, public relations, and sales techniques in order to keep their museums running and functioning smoothly. How Does a Museum Curator Find Work? Internships are a great way for aspiring museum curators to find work. Curators can work their way up at a museum from intern positions and assistant roles to research associate roles, and finally to being museum curators. Generic job search tools also provide plenty of applicable job posts. But the best way to finding a job as a museum curator is to join professional affiliations. Professional affiliations provide opportunities for aspiring curators to make connections and network with potential employers. The contacts made through these associations are great resources to discover job openings. Additionally, there are several professional affiliations that provide exhaustive job databases. The Association of Art Museum Curators, for instance, has an open curatorial positions page on their website, where members can sift through and apply for curatorial positions. What is the Average Salary of a Museum Curator? In 2017, the U.S. Bureau of Labor Statistics (BLS) reported that curators earn a median yearly salary of $53,770. The top 10% in the field make about $94,880 per year while the bottom 10% make, on average, $29,210 per year. Aspiring curators living in the following states can rest easy knowing they’re in the top five paying states for curators: District of Columbia; New York; New Jersey; California; and Nevada. There are a few ways to increase one’s chances of reaching the higher end of the salary range. One primary tip is to get a graduate degree in two museum related disciplines or better yet, complete a PhD program. According to the BLS, candidates with these more advanced degrees have a competitive edge it the job market. Aspiring curators should also seek out jobs in select industries that are known for paying curators high wages. BLS reports that curators who work in the federal executive branch; other information services; scientific research and development services; colleges, universities, and professional schools; and junior colleges, earn annual mean wages ranging from $62,670 to $84,020. Applying for jobs within these industries can greatly improve one’s chances of earning a higher salary. The employment of curators is projected to grow 13% from 2016 to 2026, which is about as fast as the average for other occupations. The BLS reports that museums receive millions of visitors per year and this number has been steadily increasing over the years. Continued interest in such cultural centers will lead to the creation of new museums and the demand for more curators. Oversees the collection, preservation, and display of museum pieces. Curators in these roles help to organize exhibitions and conduct engaging tours. People with managerial and communication skills are suited for the positions since they manage staff and regularly communicate with the general public. Curators with postgraduate degrees and extensive experience are also preferred for the jobs. Oversee the institution’s collection of valuable items to display for students, parents, and other visitors. Curators also take on teaching roles, passing down their knowledge to students interested in the field. Curators with experience, great people skills and a passion for teaching are suited for these roles. They can expect an annual mean wage of $62,670. Work at local museums, parks, libraries, and other state owned centers. Curators in these roles continue to oversee the acquisition and exhibition of key collection items. Local and state government roles can also include liaising with the general public in order to promote the cultural interests of that local government. Experienced curators with a vast knowledge of local cultures and interests are suited for the position. Curators in these roles make an annual mean wage of $54,980. Work at national museums and cultural centers to manage the acquisition, exhibition, and preservation of key national artifacts. These curators have a large duty to their country to preserve its history and cultural collections. Curators with extensive experience and PHD degrees are preferred for these positions. Curators in these roles can expect annual mean wages of $84,020.